For those who like pop music and French music, it is getting hard not to know about Olivier Marguerit, aka Ô. He's played in countless acts from the new French pop scene, from Syd Matters to Mina Tindle, Thousand and Chevalrex. He's also highly praised by his peers and iconic French singers, such as Etienne Daho, and his first album Un Torrent La Boue (BEC 5156344/5156345, 2016), has been critically acclaimed by press, radio, and web journalists upon its release. 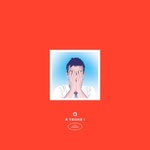 With this new album, À Terre!, in which is imagine himself falling down only to bounce back stronger, Olivier Marguerit's once again demonstrates his talent to craft exhilarating pop melodies, confirming his status as one the keystones of the rising scene of the genre in France. CD version comes in two-panel digisleeve with matte finishing; includes 12-page booklet. LP version in gatefold sleeve. Includes CD. Olivier Marguerit aka O has long been considered one of the best sidemen of French indie pop. As a permanent member of Syd Matters, he was used to drawing on his extensive background to highlight and boost the work of others -- until one day he decided to look out for himself. Following his 2015 EPs Ohm part1 and Ohm part2, O showcases his brilliant and erudite form of pop with his full-length debut, Un Torrent.